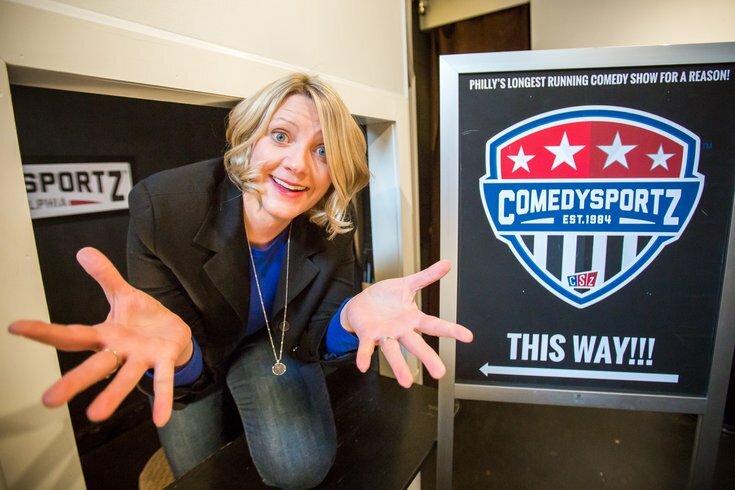 Dr. Danna Young, an associate professor of political communication at the University of Delaware, is hosting "Dr. Young Unpacks," a new political comedy show at ComedySportz Philadelphia that debuts Feb. 16. “Basically if John Oliver and Ellen [DeGeneres] had a baby – that would be the show," she says. Nothing fascinates us quite like politics these days. Thanks to the 24/7 news cycle and an almost pathological obsession with social media, Danna G. Young decided it was high time for Philly to go deep into the political abyss with a new live talk show, "Dr. Young Unpacks," that kicks off Feb. 16 at CSz Philadelphia on Sansom Street. The associate professor of political communication at the University of Delaware (and a 19-year veteran of improvisational comedy at Comedy Sportz) takes her cue from television’s most popular satirists to date like Jon Stewart and Samantha Bee with a certain amount of political wonkiness and academic lesson planning tossed in for good measure. Young’s day job allows her to regularly delve into the psychology behind the perfect storm of media, politics and popular culture that’s shaping the way we live and work. She’s got the chops, too, with bylines in The Atlantic and The New York Times and appearances on NPR. For each energetic new one-hour show, she says she’ll “unpack” a timely topic – from ISIS and white supremacy to how media influences our world – with special guests from Philly’s media and academic institutions. Young makes her home in Jersey with her husband and two kids. Dr. R. Lance Holbert, a Temple University professor, will help inaugurate the first show next month. He’s eager to take a look at tough issues in a fresh new way. While Holbert plans to delve into how TV political shows like "The West Wing" and "House of Cards" have helped to shape the modern presidential image, he says the relationship between popular culture and politics has never been more connected than now, especially if we consider that Trump was a reality TV show star before he ever took office. Young, who’s accustomed to walking a delicate bipartisan line in her own classroom, intends to do the same in the show. Yes, both conservatives and liberals are encouraged to fill the 100 seats. Likewise, her goal with the show playing to a notoriously blue city is to get people thinking about politics and media in a new, more useful way, and to hopefully bring people together who may have a lot more in common, ideologically speaking, than they may have thought. Young, an admitted "Real Housewives" franchise junkie, also says the new live theatrical format will help create an immediacy to the issues, playing on both improve and standup comedy, and audience reactions. Expect her to take on some of the most complex global issues in an unexpected way, like describing the role of social media during the Arab Spring to her college boyfriend wearing boat shoes to the dining hall. With shows like "Adam Ruins Everything" debunking long-held myths, Young admits she can’t yet know the way the show will evolve. It starts with two shows this month with an additional run in April. After that, all bets are off. Armed with a Ph.D, a sense of the absurd and tons of research, she hopes to bring some levity and even direction to those of us who may admittedly feel a little lost in the noise. “There is logic and order to all of this,” promises Young, who’s currently writing a book about satire and politics. She says she’s got the science to back her up.